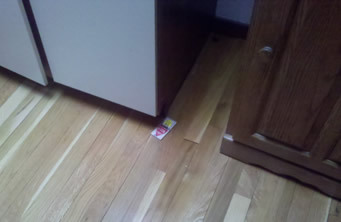 So that mouse dragged it out of the cabinet and over to the jelly cabinet before escaping. This entry was written by cac, posted on March 14, 2011 at 1:45 pm, filed under camp cornell. Bookmark the permalink. Follow any comments here with the RSS feed for this post. Post a comment or leave a trackback: Trackback URL.